Every major figure from the founding era who commented on the matter said that the Constitution gave Congress the exclusive power to commit the nation to hostilities. Notably, this included not only people with reservations about presidential power, such as James Madison and Thomas Jefferson, but also strong advocates of the President’s prerogatives, such as George Washington and Alexander Hamilton. As President, Washington on several occasions said that he could not undertake offensive military actions without Congress’ approval. Hamilton is especially significant, because his views on the need for a strong executive went far beyond those of his contemporaries. Yet Hamilton made it very clear that he read the Constitution not to allow the President to begin a war – as he put it at one point, “it belongs to Congress only, to go to war.” (References are found in my article “Textualism and War Powers,” 69 U. Chicago L. Rev. 1543 (2002), in part I.A). Thus the founding generation thought the Constitution reserved war-initiation power to Congress. How could this be, though, if Congress has only the power to “declare War”, which we may think refers to making a (now-outmoded) formal announcement? Why can’t the President begin a war informally, merely by ordering an attack, without a declaration? Perhaps, though, the President also has power to declare war (after all, the Constitution expressly says only that Congress has it, not that the President doesn’t, and it could be part of the President’s power as commander-in-chief). Returning to Hamilton, a key passage in his Federalist 32 argued that often constitutional power could be held concurrently by different entities. But, he continued, an exclusive grant of power would arise where concurrent power would be “totally contradictory and repugnant” – that is, when one branch’s exercise of a power would wholly undermine an express grant to another branch. Hamilton didn’t give the example of declaring war here, but it fits his model: war, once launched, cannot be undone without consequences. If Congress’ power is to decide when war should begin, it follows that the President cannot independently launch attacks. 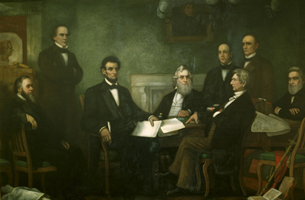 As a result, the founding generation’s views are clear and have firm basis in the Constitution’s text: the declare war clause gives Congress the exclusive power to decide when war should be “declared” – meaning begun by “word or action.” In Libya, President Obama has “declared” a war – a limited one, to be sure, but still a war by 18th century definitions – without congressional approval. 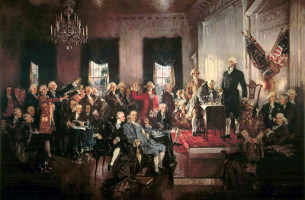 That contravenes both the Constitution’s text and the founding era’s consensus understanding. The short of it is that, in my view -- and I have a high level of confidence here -- the original meaning of the Constitution requires congressional approval for any action that creates a state of war between the U.S. and Syria. Whether very limited strikes designed to destroy chemical weapons stockpiles but not to overthrow the Syrian government or otherwise influence the course of the civil war would qualify is a closer question. But again the Johnson definition of "war" is very broad. And surely we would consider another nation's attacks on our weapons stockpiles to be an act of war, even if purportedly for a humanitarian purpose. See here for similar thoughts from Ilya Somin. Thus the ban is not on the "use of force" against another nation but on the "use of force against territorial integrity or political independence" of another nation. Can there be a use of force against a nation that is not a use of force against its territorial integrity or political independence? Textualist principles would say yes: (a) otherwise the "territorial integrity or political independence" language is surplusage; and (b) the next clause ("or in any other manner ...") suggests that there are uses of force not covered by the "territorial integrity or political independence" language which nonetheless may be (but may not be) inconsistent with the purposes of the United Nations. If so, again perhaps a very limited strike on chemical weapons facilities would not be prohibited. It would not be a use of force against Syria's territorial integrity, in the sense of attempting to forcing the surrender of territory (which is probably what the Charter's drafters, acting in the shadow of the territorial conquests of the 1930s and 40s, had in mind). Whether it is a use of force against Syria's "political independence" depends on what that rather uncertain term means. Arguably, an attack that does not attempt to influence the course of the civil war, apart from eliminating chemical weapons, does not fall within the ban; Syria would remain politically independent in the sense of remaining a fully sovereign nation, unlike for example a situation in which a new government is forced upon it by outside arms. And arguably such an attack would not be inconsistent with the purposes of United Nations, if it were only to stop the use of chemical weapons and not to affect the outcome of the civil war. I am not aware of any comprehensive investigation of the original meaning of Article 2(4)'s text, supporting this view, however.